TRIVIA of Noh : Q140 : Which performing arts has Noh influenced? | Home | Trivia | Q140 : Which performing arts has Noh influenced? Which performing arts has Noh influenced? Noh was established in the Muromachi period, and in later times it has strongly influenced many types of performing arts in Japan. One leading example is Kabuki. "Kanjinchō," one of the Kabuki Jūhachiban (18 best plays), is an adaptation of the Noh play "Ataka." "Funa-Benkei" and "Tsuchigumo" also have their roots in Noh plays, while "Suō-otoshi" and "Migawari-zazen" were inspired by Kyōgen pieces. Collectively, these are known as matsubame-mono (plays performed in front of the pine tree panel) or nōtorimono (plays adapted from Noh). Matsubame is an alternative name used in Kabuki for kagami-ita (see Trivia 137). When a matsubame-mono play is performed, a back panel decorated with a large old pine is used for the scenery, in the style of Noh theatre. Adapting Noh to Kabuki must have been difficult, because Noh was a ceremonial performance for the Shogunate while Kabuki is a form of popular entertainment. 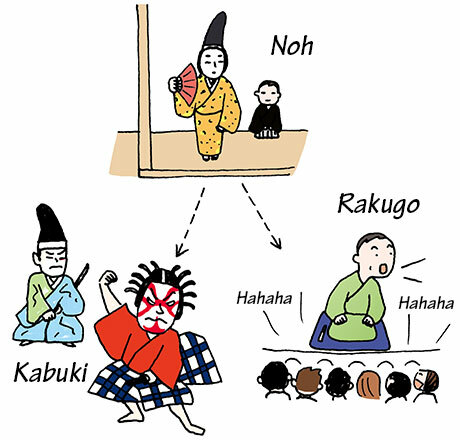 Even so, Noh also influenced an even more popular amusement, Rakugo. In the Rakugo piece "Takasagoya," the lead character Hachigorō (aka Hattsan) is asked to be a matchmaker and has problems trying to perform the Noh song "Takasago" at the wedding party. Although the common people of Edo had few chances to see Noh plays in a theatre, we know that they were familiar with the art through the songs.